How far would you go to find something that might not even exist? All her life, Cricket's mama has told her stories about a secret room painted by a mysterious artist. Now Mama's run off, and Cricket thinks the room might be the answer to getting her to come back. If it exists. And if she can find it. Cricket's only clue is a coin from a grown-over ghost town in the woods. So with her daddy's old guidebook and a coat full of snacks stolen from the Cash 'n' Carry, Cricket runs away to find the room. Surviving in the woods isn't easy. 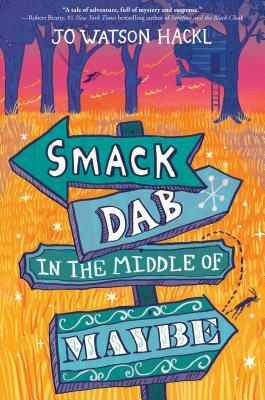 While Cricket camps out in an old tree house and looks for clues, she meets the last resident of the ghost town, encounters a poetry-loving dog (who just might hold a key to part of the puzzle), and discovers that sometimes you have to get a little lost . . . to really find your way. Jo Watson Hackl was born in Biloxi, Mississippi, not far from Ocean Springs, where her favorite artist, Walter Anderson, lived and once painted a secret room. When Jo was eleven, she moved to a real-life ghost town, Electric Mills, Mississippi, and spent the rest of her childhood exploring the woods and encountering signs of the former inhabitants. Mr. Anderson's secret room and the ghost town were Jo's inspiration for this debut novel. Jo lives with her family in Greenville, South Carolina, where she raises fruits, vegetables, and many, many weeds. You can find her online at JoHackl.com.